Note carefully the description of the wickedness. It was great. It penetrated to the deepest recesses of man. Not only to his heart, not only to the thoughts of his heart, but also to the imagination of the thoughts of his heart. Such innermost attitudes, according to the Bible, were only evil and that was continually so—all the time. Genesis 8:21 adds the information that this was not only when man was fully matured but also from his youth (Palmer, TULIP, 13). There are numerous problems with the Calvinistic understanding of these texts. First, the texts are not statements about the sinful condition of all people throughout time, but are specifically about the people who lived at the time of the flood. Second, the statements in these verses are not saying that men are inherently wicked in everything they do, but that the people at that time became wicked in everything they did. This is seen in part to the mysterious pairing of the sons of God and the daughters of men in Genesis 6:1-4, but also to the fact that when the evil intentions of mankind is described, it is their violent actions that are specifically mentioned (Genesis 6:11-13). The truth that humanity became evil is further supported by the Hebrew word for “intent” (Heb. yetzer) in Genesis 6:5 and “imagination” in Genesis 8:21 is the same word used in Genesis 2:7, 19 to describe how God “formed” man from the dust of the ground. The point is that just as God formed man to be good, now man is “forming” his thoughts and his actions to be only evil. Humanity was not evil inherently, but was forming himself to be evil continually. Furthermore, if Genesis 6:5 meant that mankind had always been evil continually (since the fall of Adam and Eve), there would be no explanation for why God was only now upset at their evil, and was only now acting to stop the spread of violence upon the earth (Genesis 6:6-7). If mankind had always been this way, God’s sorrow at the state of mankind and His decision to allow the flood waters to cover the earth make no sense. If mankind had always been this evil, then God should have always felt this way. Then there is the problem of Noah himself. Though the proponents of Total Depravity claim that Genesis 6:5 and Genesis 8:21 describe all of humanity all the time, Genesis 6:8-9 and 7:1 indicate that Noah was perfect in his generations and righteous before the Lord, and so was not subject to the depravity, evil, and violence that had covered the earth. Though Calvinists may claim that Noah was only “perfect in his generations” because of God’s irresistible grace upon Noah’s life, the text of Genesis 6:8 indicates that “Noah found grace” in the eyes of God, not that God irresistibly gave grace to Noah. It should be pointed out that there are some who argue that the righteousness of Noah had nothing to do with morality, but with the purity of his bloodline. The evil and violence that had come upon the earth, it is said, was a result of the pollution of the human race by the “sons of God” in Genesis 6:1-4. In this case, the fact that Noah was “perfect in his generations” (Genesis 6:9; cf. 7:1), does not mean that he was holy and faithful, but that the bloodline of his ancestors had not yet been corrupted by intermarrying with the “sons of God” (whatever they were) or their offspring, the Nephilim (again, whatever they were). This post has briefly considered what Genesis 6:5 and Genesis 8:21 do not mean. In tomorrows post, we will look at how properly understand these two verses in their contexts, and what they teach us about the human condition. Until then, what are your thoughts about these verses? Do they teach Total Depravity as Calvinists claim? No I dont think these verses teach total depravity. There is some truth in total depravity (Adam fell after all). The problem with ideas such as total depravity is not that they are utterly wrong but that they are overemphasised. Right. There is sin in all, and sin keeps us from God in a variety of ways, but the emphasis and ramifications of what the Bible says about sin gets a little twisted in Calvinistic thought. He confirmed my view that the baby is born with a pure soul, but the problem comes from the negative influences of those who have input in your formation, whether directly (e.g. parents) or indirectly (e.g. Hollywood). Matthew 7:11….if, therefore, ye being evil, have known good gifts to give to your children, how much more shall your Father who is in the heavens give good things to those asking him? Not sure if you are agreeing or disagreeing with the direction of the post above…. Either way, I like that verse too. Jesus, to my perception, is saying that evil mankind knows how to do good. I’d say about the purest reason for doing good is love. We love our children so that is why we do good for them. Now does that make us worthy for heaven? No. Gaining eternal life, thus avoiding eternal condemnation is always by faith, not by good works. So I don’t agree with Calvinistic perception(s) regarding this, or just about anything else for that matter. Throw the whole of Calvin’s works and that of his “children’s” into the sea, and Christianity loses nothing. You hit on an important point: Much of Calvinism doctrine comes from misapplying specific Scriptures to humanity in general. I agree. Only one example is the way in which Scripture is ripped out of its inherent historical boundaries and forced into the reader’s time frame. Josh Kelly, you hit the nail on the head my friend! I think moral depravity is too judgmental a term. It cannot be applied to the mind of man any more than to the mind of any other physical creature. As I see it, there is no true morality in the mind of man. There is only self-interest, which is the natural, driving force of physical self-preservation of the individual. Morality derived solely from logic and reason is ultimately selfish. The good of others is only important because it is necessary to the survival, well-being and comfort of the self. The self is the result of the mind, a product of the physical brain. The mind of man is not morally depraved, but morally deprived; incapable of true morality. But we are not our minds. At the core of our being we are nothing. No-thing. Non-physical. In the world, but not of it. That is our true, spiritual nature; the image of God. True morality is a spiritual thing. It derives from compassion, which comes from spiritual unity and identity, from seeing through the illusion of self; and results in understanding and charitable behavior. What we call moral depravity is a falling back under the control of the physical mind. It’s not a matter of being evil, or becoming evil, but of choosing the illusion of an individual and independent self over the reality of God. We all do it in certain moments, some of us more than others. Self-concern is in our physical nature, which comes from God, too, and is not in itself evil. As I see it, judging humanity as being totally morally depraved comes from not differentiating mind from spirit. Are you saying that in your opinion one can’t be walking a spiritual path if one maintains a belief in I? I = their own unique existence. Self-preservation is generally a good thing, and the proper choice in almost all situations; but self-gratification, not so much. The basis of the illusion is that our neighbors are our competitors rather than our spiritual brethren , and that our adversaries are external. I’m glad I asked. I can see how your two statements match. I misunderstood your first statement then. I think “the self” is one of the four key subjects that are really worth spiritual discussion. There is so much confusion about words like self, mind, soul, person, individual, and the focus of this post, our state (depraved, deprived, limited, fallen, etc). I really have to develop my understanding of the self. Now I’m curious to know what the other three key subjects are, but that’s getting off topic again, isn’t it? But maybe if you just list them briefly, no one will mind. I promise not to discuss them on this thread! I find if talking with Christians face-to-face, using this frame work allows for a richer and more open explorative dialogue, rather than allowing them to jump straight in with you must believe the Bible and you’re in sin. Genesis is just the beginning.Paul taught in Romans 3:10-11 “As it is written, There is none righteous, no, not one:There is none that understandeth, there is none that seeketh after God….Man is totally depraved as in John 6:44 says “No man can come to me, except the Father which hath sent me draw him: and I will raise him up at the last day.” and Ephesians 2:1-5 “And you hath he quickened, who were dead in trespasses and sins;” Man is DEAD until made alive! II Cor 2:14 “But the natural man receiveth not the things of the Spirit of God: for they are foolishness unto him: neither can he know them, because they are spiritually discerned.” Just because we can be “good” to each other,does not mean we are good in the sight of God,BUT it’s the typical man who wants to believe he is good in this fallen and sinful flesh. While Genesis 6:5 does speak about a specific period of time (before the Flood),but the conclusion of that verse is that Man is totally wicked/depraved and it shows Man’s true sinful nature.Me personally,I don’t use Genesis 6:5 to prove that man is totally depraved when Paul teaches that in Ephesians and Romans.Scripture teaches that man is DEAD,Dead is his Sin, and it’s God who makes one ALIVE.The simplest example is Lazarus dead in the Tomb when Jesus called him forth.Lazarus came forth.Could of Lazarus resisted? NOPE! The Holy Spirit does the very to same to us,it makes us Alive from the Dead.As John tells us “”No man can come to me, except the Father which hath sent me draw him”. “There is none that understandeth, there is none that seeketh after God.” I agree with this writer, especially if he includes himself. I’m glad you quoted all those verses, because I will be dealing with each and every one over the next 2-3 weeks. So putting that aside, what is your response to the explanation of Genesis 6:5 above? What seem to be missing in all of these comments, and possibly the article, are definitions of terms. How can there be a meaningful exchange without defining the critical terms? Is the current understanding of the English word “evil” unchanged over the centuries? Do all agree on what is now precisely meant when that words used in scripture? If so, then is there certainty that the commonly understood meaning today embodies the same concept authors of scripture had when they wrote in Hebrew, or Greek (or any other language) thousands, or even possible hundreds of years ago? Shouldn’t these questions be considered for every critical term in each comment. Otherwise what exactly is accomplished, apart from voicing opinions? The conclusions you draw from Gen 6:5 are wrong because your exegesis is superficial or careless. You say “the people at that time became wicked in everything they did”; “humanity became evil”; and that “humanity… was forming himself to be evil continually.” The Hebrew text will simply not allow these conclusions. This asumes humanity was not evil (as you put it) before Noah’s generation. It became evil or was beginning to form itself to be evil. But the Hebrew text simply says that the Lord saw the wickedness of man was רבה (great, many, much). 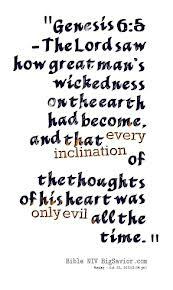 It means that while humanity was wicked after the fall in all the “form/purpose of the thoughts of his heart”, that wickedness was now great; it was multiplying every day. That’s what changed in the equation if you will. Not that it began to form form itself to be evil. Please show me where the word “began” is in the Hebrew. Then you say “If mankind had always been this evil, then God should have always felt this way.” Here is where you are misleading, because the text does not say God was surprised and greaved by the wickedness of mankind, but that God was grieved because the wickedness was great upon the land/Earth. It was multiplying in its manifestation of violence and perversity. That is why after the flood God instituted human guvernments; to keep the manifestation of that wickedness in check. The conclusions you draw from my statements are wrong because your reading of my post is superficial and careless. When I talk about wickedness and evil, you think I am referring to their nature, when a more careful reading of my post would show that I am referring to their actions and behavior. Therefore, I am saying the same thing you are, that humanity was multiplying in its manifestation of violence.